‘What religion am I?’ asks Homer Simpson in one episode of his family's eponymous cartoon. ‘I'm the one with all the well-meaning rules that don't work out in real life…uh…Christianity.’ One of the many pleasures in Diarmaid MacCulloch's amazingly comprehensive book is getting a handle on what historical basis there is for the rules and doctrines of this prolific and mercurial religion, which nowadays seems characterized by extreme reactions of either perfect secular indifference or increasingly literalist devotion.There are excellent books available for all kinds of angles on this story, but a single-volume history of the whole lot seems crazily ambitious. I think MacCulloch has done a beautiful job, and let's note the fact that anything which is acclaimed by both Christopher Hitchens and the Archbishop of Canterbury as being the definitive work of its kind must be doing something right. What makes it particularly impressive is that it combines a clear explanation of the usual theological debates of the early Church with a very wide-ranging, internationalist scope that also has perceptive things to say about Christianity's survival and development in Ethiopia, or why it succeeded in Korea but failed in Japan.Though MacCulloch is too even-handed to build a cumulative argument out of this story, the theme that emerges for me is the constant interplay between Christianity's interior, metaphorical truths, and the factual historicity of the information by which such truths have been communicated. This is related to a crucial duality present from the very start.Jewish and Christian traditions want to say at the same time that God has a personal relationship with individual human beings and that he is also beyond all meaning, all characterization.In part this comes from the dual heritage of Christianity, which is well encapsulated by this book's provocative subtitle, ‘The First Three Thousand Years’. The first 70 pages trace the Greek philosophical traditions of thinking about divinity – the Platonic idea of a remote, unknowable God – which became fused with Judaic tradition in an uneasy but dynamic relationship that is unique to Christianity.One result of this, after the Enlightenment, has been a hyper-literalist defence of religion which in modern times can be seen, especially in the US, in the uneducated flourishing of ‘Creationism’. MacCulloch, who demonstrates well that ‘there is no surer basis for fanaticism than bad history’, gives such concepts short shrift.The modern conservative Christian (and Islamic) fashion of Creationism is no more than a set of circular logical arguments, and Creationist ‘science’ has been unique among modern aspirations to scientific systems in producing no original discoveries at all.Quite; and yet, despite referring to modern ‘fashion’, one thing this narrative shows is that polarities of literalism and metaphoricity have always been there. In the second century, Marcion of Sinope was already writing commentaries on Biblical scriptures which denied any but the most literal interpretations; while his contemporary Origen could write such opposite things as this:Who is so silly as to believe that God, after the manner of a farmer, planted a paradise eastward in Eden, and set in it a visible and palpable tree of life, of such a sort that anyone who tasted its fruit with his bodily teeth would gain life?MacCulloch notes drily: ‘Origen might be saddened to find that seventeen hundred years later, millions of Christians are that silly.’ And yet neither of these theologians really won out: both saw their writings declared heretical, and the ‘official’ Churches have maintained an uneasy balance between the two ever since. Reading this, it's impossible to escape a sense of arbitrariness about such decisions among early religious authorities.This is particularly true when it comes to the bewildering array of theological debates over what exactly was meant by such counter-intuitive doctrines as the Trinity, or Christ's divinity. It's instructive to consider how little modern Christians think about such things, given their central importance to early thinkers. Were the three persons of the Trinity separate substances, or one substance manifested in three different essences? The difference was almost wholly semantic, and yet people fought and died over it. Did Christ have two distinct natures, fully human and fully divine, or did he have one composite nature which blended human with divine? The question was fought over with a violence and vehemence that now seems incredible. Those involved would be amazed to know that many modern Christians are probably not sure of the ‘right’ answers to these questions.While MacCulloch is bracingly clear on the arbitrary nature of many of these doctrines, he is also often critical of modern revisionism – he offers a reminder, for instance, that Gnosticism, far from being a kind of early New-Age mysticism, was generally much more ascetic and authoritarian than mainstream Christianity was. Similarly, a text like 1 Timothy 2:12, often pounced on by the anti-religious because its patriarchal ideas seem so opposed to modern values, is here given a far more interesting and nuanced reading:One has always to remember that throughout the New Testament we are hearing one side of an argument. When the writer to Timothy inisists with irritating fussiness that ‘I permit no woman to teach or to have authority over men; she is to keep silent’, we can be sure that there were women doing precisely the opposite, who were probably not slow in asserting their own point of view. But their voices are lost […].One thing that this book creates is a deep awareness of just how different things might easily have been, had a few decisions gone the other way. It is fascinating to realise, for example, that if Islam had not suddenly exploded across the Middle East, the centre of Christendom in the Middle Ages would almost certainly have moved east to the region of Iraq, rather than west to Rome. MacCulloch is especially good on the interplay between these two faiths, offering such titbits as the fact that Islamic minarets may well have come about in imitation of Christian stylites – the early Orthodox monks who lived their lives on top of pillars. Such fascinating windows on history and belief are thrown open right the way through to the modern day, revealing such unexpected delights as the fact that most Christians among the Maasai in southern Africa think of God as a woman.It's hard to find much fault with this book, although there will always be sections where the narrative flags a little, depending on where your interests lie. I thought the tone was exemplary – in the words of Rowan Williams, who reviewed it for the Guardian, it is ‘neither uncritical nor hostile’, which is no small achievement in itself. In one of his most felicitous phrases, MacCulloch describes Christianity at one point as ‘a marginal branch of Judaism whose founder left no known written works’. Such a faith is always going to be a struggle between different interpretations, leading to a term – ‘Christianity’ – which can embrace the incense swung around an Orthodox icon, the speaking in tongues of a Pentecostalist, the resonant stone slabs which call faithful Ethiopians to prayer, and indeed the breezy indifference of Homer Simpson. If any book can give you a sense of how such diversity developed, and what it can possibly have in common – it's this one. This book should have been called Christianity: A Speculative History from a Somewhat Antagonistic Viewpoint. I only read the first 150 pages, plenty far enough to understand how MacCulloch feels about Christianity. Most of the book is, by nature, extrapolation based on a very fragmented set of documents and conflicting histories, but MacCulloch is always overanxious to undermine Christianity by taking huge leaps of speculation and is never, at least that I saw in the first 150 pages, willing to remain neutral or actually go the other direction.I found his writing style to be good and the idea for the book is fantastic. I'm fully prepared to deal with problems in history and with the faults of Christians throughout history, but I'm not willing to read a book by an author I feel I can't trust or have to constantly second guess. Because of that, the bits of information I gleaned are all mentally footnoted as being something to go back and verify from a less biased source.Here are a few examples:"Yet at the heart of the Egypt and Exodus story is something which no subsequent Israelite fantasist would have wished to make up, because it is an embarrassment: the hero and leader of the Exodus, the man presented as writing the Pentateuch itself, has a name which is not only non-Jewish but actually Egyptian: Moses." My response is that if the Israelites lived in Egypt for 430 years is it so surprising and embarrassing that they'd eventually adopt Egyptian names? If the implication is that Moses was actually Egyptian, why doesn't MacCulloch just say that. It wouldn't be the longest logical jump he makes in the book.Later, this is what MacCulloch concludes about the Beatitudes. "There is nothing gentle, meek or mild about the driving force behind these stabbing inversions of normal expectations. They form a code of life which is a chorus of love directed to the loveless or unlovable, of painful honesty expressing itself with embarrassing directness, of joyful rejection of any counsel suggesting careful self-regard or prudence. That, apparently, is what the Kingdom of God is like." Really? Only the most literalistic reading of such a poetic passage could lead to such an imbecilic interpretation. MacCulloch makes similar mistakes of interpretation of various other passages in the New Testament, notably in the Lord's Prayer and the command to "leave the dead to bury their dead. "When writing about the resurrected Christ (note, resurrected) he says, "He repeatedly appeared to those who had known him, in ways which confused and contradicted the laws of physics." Again, we are talking about a ressurected being. Why is physics even relevant?When he refers to Paul and his desire to teach of salvation through Christ alone, MacCulloch phrases it this way: "Paul managed to find a proper in the Tanakh to sum up what he wanted to say:.." This comes across as incredibly condescending, to take for granted that Paul was just manipulating the Tanakh to justify his message. If MacCulloch had left out "managed to find" and replaced it with "found" it would have made all the difference. It is maybe a small infraction on its own, but it was, for me, the last straw.In a way, I'm really disappointed to stop reading this. The parts of the book that talk about the origins of the Old Testament and the influence of Socrates and Aristotle on Christianity are great. The discussion of differing ideas of Satan, comparisons of Proverbs and Ecclesiastes, ideas on prophecy and life after death in the Old Testament and the obsession with the virginity of Mary are all fascinating. For now though, I'm done. I don't have time to verify every reference and I don't trust MacCulloch to give it to me straight. It took three library renewals to get through this book (and thanks to an ice storm, the fifth this year!, I still owe the library a one day fine, a whole nickel that they thank you for and dump in a desk drawer with a bunch of rubber bands, and I love living in the country and having that library), and then work kind of slammed me a little, so it’s just been sitting there languishing on my currently-reading shelf for two weeks. And in all that time I still haven’t come up with something deeply insightful or clever to say. I keep coming up with jokes, like, “You know what they say, ‘An atheist is just someone who’s studied their religion.’”Honestly, this book was really very good. It’s history, which I love, and religious history, which utterly fascinates me with the scale and grandeur of brutality people are willing to inflict on other people in the name of charity and salvation. The whole book— which kept switching from the macro to the micro with expert timing, by the way— I just kept picturing all of this three-thousand-year saga, a hiccup on the evolutionary timescale, playing out from the vast vantage point of elsewhere in our galaxy, where we’re not even a blip of starlight in deep space. And if it didn’t seem petty before, well.Back down on an earthly scale— or not even that, on a continent’s scale, country by country— the epic and the exhaustive scope of MacCulloch’s research has to be praised. I can’t imagine taking on a scholarship of that magnitude. It’s just bewildering in breadth, and meticulous in detail. All told, though, I much preferred Robert Wright’s The Evolution of God; not because it does the subject more justice, but because it deals with the slightly different angle— the actual evolution of the anthropological and sociological aspects of a religion, as well as what is worshipped within it— that is far more fascinating to me. For a history of the church, though, you couldn’t do much better than this without devoting your time in semester-sized chunks, and maybe not even then.Honestly, to hold onto the mystery and conviction of a religion: don’t study its history. This book is seriously insane! I'm only halfway through and we've already covered: Rome, early popes, African christians, the Orthodox Church, the beginnings of various brotherhoods and convents, ways to pray, Constantine, early theologians and philosophers, pergatory, the energy of God. I can't list everything. The only issue I have is that it's just too much at once. This is the perfect book for someone studying theology.The Virgin Mary, the Tartars, the reformation and restoration, Martin Luther, Methodist and baptist churches, celebration by slaves, French Revolutionv, Bible Production, Free Masons, Quakers, witches, missionaries, Jesuits, the end of the British empire, Bonhoeffer, the Nazi regime, Pentocostalism, teaching evolution, apartheid-the list is endless! This is a very good history. It depresses me a bit because it is written in the cynical, anti-establishment style which is typical of the educated elite today, but it is valuable for its quality and the insight which it offers regarding the multitude of different takes on Christianity (most of them sincere and justified, none of them isolated from political expediency) which were the fruit of the early Church. Its quite humbling for those who maintain 'the correct doctrines' and at the same time gives one the more justification for preferring the views that one holds. Oddly enough the last word in a huge tome seems to tell that it is, of all things, the doctrine of original sin that gives Christianity its most promising hope for continued relevance into the future! This is a rather astonishing overview of the history of Christianity. An ambitious subject to handle in one volume, and the author does a fine job as discussing the most disparate strands of this almost universal faith. The title seems a bit odd at first, considering Christianity is only two thousand years old. But the author does not skimp at first, covering the Platonic and Hebraic traditions and how they affected the background of early Christianity. One of the more interesting assertions is how Christianity spread into the Middle East and North Africa, in a different form than either Orthodox or Catholic Christianity. Of course, this changed rapidly after the meteoric rise of Islam. The predominance of Roman Catholicism in the West was by no means assured in the earlier period. And it splinters and splits and feuds. Dozens of sects and wars. It's humbling and rather sad. So many heresies and papal bulls it's -almost- hard to keep track. Killing in the name of peace. Yet the author somehow makes it easy. His tone is distantly affectionate, yet skeptical. Another interesting analysis is how Christianity spread in the modern world. For example: a form of Presbyterianism became an essential part of Korean national identity, as a means of rebelling from Chinese influence. As a result, South Korea is one of the most Christian nations in Asia, second only to the Philippines. There is also the issue of how Christianity has reacted and counterreacted against movements of social reform, humanism, and the later 20th century, somehow surviving them all. Of course, some aspects of conduct were less than exemplary (ex: The Catholic Church not allowing the use of condoms, even against STDs, and their snubbing liberation theology) and some were rather progressive (ex: The same Catholic Church broadening 'pro-life' to be 'anti-war' as well as a position on reproductive rights).Of course, because it is so huge and divergent, that is precisely why it is impossible to characterize the whole 'Christian' population. Of course there are some aspects which could use further exploration. But there is still so much here, that this will be a solid reference for any interested scholar, skeptic or true believer. MacCulloch makes reading exhaustive history exhilarating rather than exhausting, and although everyone will have a favourite nit to pick - mine being the dubious treatment of Hegel, and the absence of anything about Erigena - only the most die-hard partisan could claim that this is anything other than brilliant. Ignore anyone who tells you it's anti-(insert your own sect here), and read it. Take your time. And I'm sure you'll be mining the 'recommended reading' section at the back of the book before you've finished chapter 7, at the latest. What I want to know is how MacCulloch manages to tell a linear story in a way that doesn't pervert the thematic content... or maybe he's written a thematically arranged book which doesn't pervert the temporal changes? In either case, a great relief from most long histories which are full either of repetition or of anachronies. Finally, I would guess that this is the only perspective from which such a book could be written: son of a clergyman, friend of but not believer in the religion, who obviously nonetheless cares greatly not only about its history, but also about its survival. Avoid, of course, if you want a biased, slanted interpretation of any given point. This book may be too ambitious. It claims to cover three thousand years of global history, but it does so sketchily, most of its focus being on, first, the Middle East and, second, Europe and America. The Britishness of the author is clear as is the fact that he himself is not a Christian. The content ranges from the breezy, as in his descriptions of modern trends, to the dense, as in his treatment of the controversies animating the earliest church councils. Most readers will find parts of it objectionable--or, perhaps, find its omissions so.Still, it is not a bad read. MacCulloch writes well enough, peppering his tale with occasional amusing anecdotes or light sprinklings of wit and sarcasm. I found none of it boring and some of it, most particularly his treatment of Christianity in sub-Saharan Africa, informative.My greatest objection to this enormous undertaking is that MacCulloch offered very little insight to the mysteries of the Christian faith. From my perspective, such "mysteries" are those elements of Christian belief that appear to fly in the face of experience, reason and common sense. How was it, for instance, that people murdered other people over questions of the exact nature of the the procession of the Holy Spirit within the Trinity--or for any number of other (to me at least) obscure reasons? That they did so is fact. Why they said they did so is often on record. MacCulloch reports on these matters well enough. What he doesn't do is offer insight into the real interests and passions involved, into the psychologies of those people. I want, in other words, a book that makes such concerns real to me, rather than just another at-a-distance description of the surfaces of history. Exactly three months later, I'm done! Review obviously to come. Christianity is complex. After having had read this book two years earlier, I had to reread this book in order to understand why I didn't understand it the first time I read it. The first time I had read this book I was trying to make sense of the Trinity and how it developed and caused differentiation between sects of the Christian faith. I realize now that was a mistake. Whether it be one person, one nature, and one will; or two people, one nature, and one will; or ....... doesn't make sense and never will and trying to understand that is a wasted effort and anyone who doesn't believe in my narrow interpretation is deserving of death (j/k, but historically that is what happened). Once I got past trying to make sense of the religion qua religion, I got to concentrate on the history qua history and found the story worth understanding. The author excelled at telling the story from the reformation onward, and there is no easy way to tell the early church story in an easy to digest format without leaving out major parts in a one volume work such as this one. The book does not really dwell on the theological thought and always tries to focus on the history. Therefore, sometimes the relevance of some of the characters are not fully understandable from this book alone. The significance of Pelagius in relation to Augustine and the importance of 'free will' and our reliance on Grace may be lost on the reader of the history alone and how this will lead to St. Thomas Aquinas' rational argument for a 'necessary' universe until reinstated by Martin Luther with his absolute certainty of a contingent universe (similar to William of Ockhem, who would say that God is all powerful so nothing is necessary to an all powerful being). The author will mention Pelagius, for example, but all the relationships and the importance of what he means gets lost with the history story telling. That's okay, because after all this is a history book most of all. I'm what you might call a slightly bewildered agnostic, but I've always had a particular interest in Christianity. So much of its own history - fragmented, argumentative and hypocritical - has always seemed to be at odds with much of Christ's core message, and I've never quit understood how so many Christians can fail to see that contradiction in their own faith's history. But this book, which is surely destined to become a classic in the field, goes a long way to explaining why Christianity has had so many schisms, so many sects and splinter groups, reformations and counter-reformations.It is an immense book, and justifiably so - such a complicated history, ranging across the entire globe and spanning more than two thousand years, could scarcely be anything less, but it rarely flags or fails. It is a difficult history to tell, particularly when the major Churches begin to establish themselves - the early African churches, the Ethiopian Church, the Greek Orthodox Church, the Roman Catholic Church, the Anglican Church - and it becomes impossible to tell the full history in any meaningfully chronological way.But it's well-worth the challenge, particularly in the areas not usually focused upon in the West - such as the Greek and Russian Orthodox Churches. I personally found it particularly interesting to see the history of Christianity as a whole and how all the different Churches that seem so far apart relate and respond to one another; and particularly how the various trends in religious attitudes and behaviour have evolved and changed over the centuries.It's hard to tell MacCulloch's own position from this book, and that's another mark in its favour. If I had to tell, I'd say the overall tone is one of fond and perhaps somewhat bemused affection, tempered with a healthy dose of enlightened scepticism. It makes for a lively and engaging read, although not one to be entered into lightly. Well, I'm currently reading this, and probably will be for some time. This is my go-to book at bedtime. It's rich with explanations of periods and time that my education skipped over—oh, let's be frank, my education didn't even go faintly near, periods like the entire history of the Eastern Christian Church and the millenium of Byzantine history.Where I come from, the midwest of the 1950's, it just didn't happen, right?Trying to make up for that now, I'm discovering whole worlds of thought and dispute among Christians that really lightens the heart during these times of absolute rock-bottom handcuffing of American politics to some kind of third-grade version of Christian thinking.Such a rich tradition, full of hope and possibility abused by certain people towards exclusion and division. Well, it's time I caught up with the resilience, variety and depth of the Christian tradition. MacCulloch is so uptight PC he must squeak when he walks. The first tipoff is his use of CE and BCE instead of Anno Domini (AD) and BC. CE refers to a "common era". The terms he uses are used by certain publishing houses and writers to "avoid offending non-Christians". The use of these terms seems ludicrous considering the subject of his book. His survey of Christianity seems to me to not be dispassionate or objective. It gets more PC the closer he gets to our time. The book is over 1,000 pages and I didn't find much in it I didn't already know. I don't trust his objectivity because he lost a high-ranking position in his church when he was outed, and he seems to be sneering at Christianity. All this and I'm not even a Christian. MacCulloch's history of the Reformation, which I read a few years ago, was powerful, informative, engaging, and even inspiring in places. I had high hopes for his one-volume Christian history with its intriguing title.He spends hundreds of pages on the roots of the Christian tradition (that first one thousand years) beginning in Greece and not the Ancient Near East. While it seemed a pretty standard presentation of these ancient histories, it was primarily a history of ideas, which intrigued me for the possibilities of what was to come -- was he going to focus on ideas, particularly the development of these concepts from Greek and Hebrew culture? No, that's not what happened, leaving me to puzzle over why so much time and space were spent on these origins.Increasingly church histories have devoted more attention to the non-European parts of our story. Ever since my first church history class in college, I've been interested in the little tidbits about these churches and with each new volume I'm pleased to see that the tidbits have turned into more full-scale treatments. Not only does this volume give a much fuller treatment of the Orthodox Churches, the Churches of the East are treated with more detail (though I still desire more), plus he followed their history first after the division of Christianity after Chalcedon. Later he gives much attention to the developments, particularly of indigenous movements in Latin America, Africa, and Asia. That said, there still seemed to be too much focus in the early sections on the development of Roman Christianity (as compared to the other versions) and in later sections he is very Anglican-focused, which is understandable since he is.MacCulloch is a little less interested in dates and names and more in general movements and trends. So, I was glad I already knew some of that from previous books I'd read. I'm not sure for someone who came to this as their first church history if they would be lost or confused or would benefit from this lack of information.Also, there were the things I missed seeing. Some of this is just picky or my own preferences or enjoyments. But there were at least two times it seemed really to hurt the narrative.In particular, there is no discussion of the divisions in the Dutch Reformed Church around the theology of Arminius. This is strange given that Arminius is mentioned as an influence on Wesley and then the term Arminian is used multiple times in the narrative after that. But never was that story told.The other absence was the development of the African-American church and religious experience. No mention of Nat Turner. No discussion of spirituals. No black liberation theology. The treatment of Martin Luther King, Jr. was piss poor. Though there was discussion of race and slavery and its stain on the Christian story, I don't think it was given the attention it deserved. I'm influenced in that thinking by Willie Jennings and Kameron Carter and their books exposing the racism that pervades modern theology.Finally, I was not sure of the overall theme that MacCulloch wanted me to take away from the book. LaTourette's church history was focused on the theme of missions. Paul Johnson highlighted figures who were more open and broad-minded struggling against forces in the opposite direction (Erasmus, Locke, and Voltaire were heroes in his volume). I'm not sure what the theme was here.Opposite all that criticism is the praise for MacCulloch's writing style which is clear and enjoyable and not "academic" in a bad way. He also employs a good sense of humour now and then. And throughout the book draws attention to how old debates or turns of events continue to impact world politics and/or the Christian faith in the 21st century. This makes it an enjoyable enough read, as I have devoured little but it the last few weeks (and at 1016 pages it took a few weeks). I was looking for a straight forward, unbiased and thorough history of Christianity so when I found this book at my local bookshop and read the title I assumed that exactly what it was. Unfortunately, after reading the first 300 pages I decided to put it down. This book is certainly thorough, however, it is neither straight forward or unbiased. Firstly, the author's style of writing is very "busy". Points and ideas that could easily be made in 1 or 2 sentences usually takes the writer 4 or 5 to get across. He also uses language, idioms and wordplay that makes reading this book a real chore. It is no wonder this book is over 1000 pages long, I think it could be easily cut down to around 750 if it was written in a more reader-friendly style. This writing style has nothing to do with an intellectual gap between author and reader because I have read numerous other history books by British intellectuals that flowed much better and were real page turners. Secondly, this book is written in a very cynical, anti-Christian manner. I say anti-Christian and not anti-religious because while the author takes numerous quips and digs at Christianity, usually as a sarcastic remark at the end of a long, drawn out point, he never had anything negative to say about Judaism or Islam whenever those religions are part of the story. Another point that irked me about this book is the use of BCE and CE instead of AD and BC. I know the author is just being PC (same reason why he doesn't take digs at the other two major religions discussed in this book) but I think it is really silly to avoid AD and BC especially given the book's subject matter. In conclusion, I was disappointed with this book. It was neither as well flowing or as unbiased as I hoped it would be. I am going to look for a more balanced and complete history of Christianity. to read 1100+ pages of christianity's history is to read 1100+ pages of world history since christianity has been a prime mover of human history. every continent and every religion has found a place of clarity in this book. it does not disappoint. whereas it is true that to cover 3000 years of human and religious history, the writer must default to an inch and a half below the surface and some readers may be disappointed in that factor, i decidedly was not. the sheer breadth of the work, by default, wove together so many disparate parts that i can not help but appreciate the effort. we know most of the information therein ... but in pieces. seemingly without effort, macculloch weaves the ideas together, making connections, showing cause and effect, and more often than not doing so seamlessly. but getting through this book without becoming dizzy means the reader must pace herself. i took the 40 days of lent (started a week before; ended a week early) to tackle the job. it was worth the effort. and some of his (almost casually thrown off) conclusions were just plain insightful. i'm rather pleased with myself for getting through this religious history and am very sure that i will be referencing it regularly. i also have the bbc dvds of the series made from this book. looking forward to watching it and hope not too much has been left out. after reading the entire book, i cannot help but think that every detail matters. that's how well macculloch presented the material. I'll begin my review this way: there are a few reviewers who did not like this book due to the secular (but by no means anti-Christian) perspective most educated readers would expect from a serious church historian. (Naturally, many of these reviewers associate MacCulloch with the atheistic academic left, which I'm sure would come as a surprise to the author, given his background in the Church of England.) If Christian apologetics masked as church history is what you are looking for, then I have a few titles for you, but they are tear-your-eyeballs-out-bad.Suffice it to say I have been looking for a book like this one for a long time - and I doubt a better book on church history will be written anytime soon. The book is information-dense and rather dry (but, in all fairness to MacCulloch, a litany of jokes may have added a pound or two to this already hefty tome). Diarmaid doesn't spare us any details.I was tempted to give this book 4 stars instead of 5, because it is the kind of book where you often have to read a passage more than once - and even then, the details don't always stick. That being said, I found it rather engrossing - and regularly consulted other books on my shelf when reading it.A very enriching read. This kind of book is exactly why the adjective "magisterial" was invented. It's so learned, engaging, and comprehensive that by the time you finish it your mind feels full. It's nothing less than an attempt at a truly "ecumenical" (pun intended) history of Christianity, covering not only its temporal history, which as you can tell by the subtitle goes back much farther than the BC-AD line, but also all of the different denominations, their doctrinal disputes, the major figures, philosophical lineages, and how the various Christian faiths changed and were changed by the countries they touched. If that sounds just a little too ambitious to be doable, let me say that MacCullouch pulls it off magnificently. He seems equally comfortable recounting the most well-known events in Christianity, like the Council of Nicaea and the Reformation, as he does delving into the most obscure sects and controversies, and he is admirably even-handed when he gets into the weeds of the many, many schisms and splits Christianity has undergone since before the ink was dry on the very first epistle.I think I found the controversies most interesting: Miaphysitism vs. Diaphysitism, Monophysitism vs. Nestorianism, Arianism vs. Trinitarianism, transubstantiation vs. consubstantiation, iconophilia vs. iconoclasm, faith vs. works, making the sign of the cross with three fingers vs. making it with two, and more, in an unbelievable, one might say miraculous profusion. I enjoyed reading about them not because I'm a smug atheist (although I am), but because even though these violent, frequently lethal disputes seem maddeningly pointless all these years later, they bring home how nobody is exempt from the unquenchable human need to split hairs and make mountains out of molehills. Someday many of the issues I care about will be totally irrelevant, and even though I can claim that at least I'm not wasting my time arguing over just how many loaves and fishes got multiplied or the proverbial angels dancing on a pin, it's humbling to see all these obviously smart people like Aquinas and Augustine spend their time on Earth wrestling with Big Questions through the medium of theology. Who can say what will seem ridiculous thousands of years in the future, and aren't we still dealing with many of the same questions of meaning and purpose that troubled these ancient people? It really helps put your own concerns in perspective, although quite frankly it's tough not to feel smug when you're reading about the sacred towel Mandylion, or some of the weirder cults like the Skoptsis, who had mandatory castration for initiates (!!! ).Where MacCullouch's curating and narrative genius really shines through is in knotting together all these narrative threads across millennia and continents into the full story of one of the most influential ideas in world history. Time and time again a group of people will try to freeze their belief system into an orthodoxy, and then it will fracture under the weight of numbers, or through contact with another group, or from some lone individual convinced they've gotten a True Revelation. Then to these spiritual arguments you add the political dimension - the Byzantine Empire in particular was frequently crippled by religious arguments, but the lesson about the perils of entangling spiritual and political power is universally applicable. I finished this book on Easter Sunday, interestingly enough, and although I'll still never be able to understand how people can believe that someone magically came back from the dead, I think I have a greater appreciation for how this need for mystery and worship has endured over time. A great reference book on the topic. I would not say it is an easy read as MacCulloch does cover almost all the major traditions and their philosophies within the history of the Christianity. Because of the vastness of the subject, the book at times reads like witty encyclopedia rather than a monograph. Yet such scope, along with MacCulloch's meticulous use of existing literature on differing subjects, make the book a welcome addition to any (e)library. http://nwhyte.livejournal.com/2021907.html[return][return]This magisterial and thorough book goes through Chrstianity's roots in Judaism and Greek philosophy, the life of Jesus and the immediate aftermath, and then the historical development of the movement that his followers became. I learned a lot; MacCullough's broad historical focus took us to places I had not really thought of before, like the early history of Christianity in Asia (including China), and explained to me stuff I thought I already knew about, like the Polish-Lithuania commonwealth (where MacCullough's account is much more lucid than Norman Davies'). He is lucid and non-judgmental, and usually manages to avoid taking sides (though this slip occasionally during the later discussions of Anglicanism). The triumph of the book is that he does avoid the Whiggishness of some approaches which take it for granted that two thousand years of history were somehow destined to bring us to the Anglican Communion (or Pope Benedict XVI, or whatever the author may support), and by putting the problems of the various churches today in the historical perspective of the viciousness of past debates, the entire situation becomes more comprehensible. It's very long but well worth it. 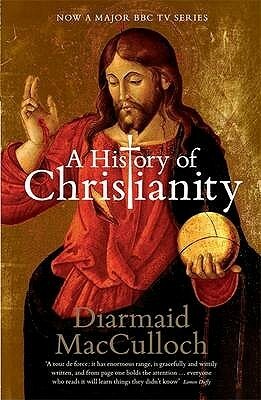 4 STARS FOR "A HISTORY OF CHRISTIANITY: THE FIRST THREE THOUSAND YEARS" BY DIARMAID MACCULLOCHSimply put, whether you're religious or not, you cannot deny the importance and impact religion (Christianity, specifically) has had on the world. Researching and studying the different religions and cultures helps us to gain understanding and respect for the world that we now it, and the kind of world that it was shaped from. Diarmaid MacCulloch approaches Christianity (and some of the other monotheistic religions like Islam and Judaism) from a strictly historical perspective. The author did not write this intending to debate whether there was or wasn't a God, or which religion is closest to the "truth". He writes on the important historical figures integral to Christianity, their viewpoints and contributions, and how Christianity's relations with Roman politics helped it either flourish or struggle under oppressive regimes. As a Christian myself, I came away from this with a much larger understanding of the historical background to my own faith, through an author who remained largely unbiased and neutral throughout his own exploration. A recommended read for anyone looking to study the origins of Christianity. This thousand page tome is excellent, with all the limitations of a single-volume work on such a large topic. The writing is excellent and the narrative coherent, but it is very dense. Don't expect this to be a quick read. It is heavily documented, but as usual the notes are stuck in the back instead of at the bottom of the page. (Okay, I'll stop ranting now.) The author begins a thousand years before the birth of Jesus and comes right up to the beginning of this millennium. He pays as much attention to the church in the East as to Rome and the West, which I consider to be the distinguishing feature for an history of the Church. It is a traditional history in that the focus is upon social and political structures: how the the union of the Church with the State affect political and economic events? His treatment of saints, miracles and other supernatural phenomena is classically skeptical, but not dismissive: he tries to view events from the standpoint of the participants who hold a worldview so radically different from his own. Another great strength of this work is the sections in the back on "Further Reading." It's a great first textbook on the history of Christianity. A massive book--over 1000 pages. It was not easy to finish just because of the size of the book, though the style was very readable and engaging. I didn't get bored throughout; quite the opposite--I was eager to read and learn more. This history helped connect lots of other historical events and developments for me, as if the religious aspect provided a key element to understanding the past two millennia of Western history, an aspect that has been neglected in other histories. Other than providing me with the religious background that illuminated the rest of history, the great lesson that I gleaned was the immense diversity of the Christian family, over time and space. There are many, many ways that the Christian message has been taught, lived, and understood. I would also recommend this book to any skeptic who thinks Christianity is personified by the modern evangelical or fundamentalist movement. This is a recent innovation of Christianity, and far removed from most of Christian history. Whew! What did I learn? I don't know how much I can remember but there's a whole lot of very interesting information packed into this book - 1100+ pages. I read MacCullough's The Reformation a few years ago and was very impressed. This book isn't quite as tight as the former but the scope of this book is 10 times as long and many continents broader. MacCullough covers it all - from the works of "David" to Islamic terrorism. From Jerusalem to New York, China and Africa. From the Israelites to early Christians to Mormons, Pentecostals, African variations and so on. He works with the philosophies and the schism, with the slave trade, the Holocaust and current issues. There are lots of little tid-bits of fascinating material. The book lags sometimes but for the most part MacCullough maintains a flowing narrative - my interest was usually up. It's not a spiritual book, there's no evangelizing or "guidance" at all, and I hIghly recommend it for anyone interested in the history of Christianity itself. For all its scope, this never fails at being readable. The style is engaging; MacCulloch clearly loves his subject, but as a product of late western enlightenment ideals, has enough distance to be able to bring an outsider's perspective to it. He is wry and funny and occasionally cynical without being overly critical. This is not, nor is it intended to be, a coruscating iconoclastic destruction of Christianity. If I have a criticism, it is that MacCulloch too often accepts the justifications of Christians on their own terms. He is a little too willing to handwave away theological paradoxes and hypocrisy, but does at least acknowledge when the church has been responsible for misery and genocide (although never without an anecdotal antidote in the form of the "one good priest" that stood up against the establishment and etc etc). An excellent and enjoyable read, and a good way for militant atheists to learn about the history of christianity without angrying up the blood too much. Via book and audible . Fundamentally, the scale of the achievements of a book like this can’t be doubted ; it is sure footed over a huge canvas, deft at the intermingling of religious and world history, and acerbically witty with it. It is not , however, without error . For starters , it states that all the psalms are attributed to David and this is an error of scripture because some are patently later when in the Bible they clearly aren’t ; some attribute to his contemporary Asaph, some to no one , and at least one is obviously from the Babylonian exile . This is such an odd mistake that should surely have been picked up in editing , that it is hard , if mean spirited, nor to see it as deliberate .Treatment of other bones of contention is also, if not wrong, one sided :The old chestnut of the only known Augustan census taking place in 6 AD , when Quinirius governed ( as mentioned by Luke) , which is too late for Herod’s death in 4 BC, is raised. While we know we can take the view that chronology is not of first importance here and approximate pinning ta a known event is fine, we know from Augustus’ journal of his reign that he did wide censuses in years now identified as 8BC and 2BC and 14 AD. We also know that there was a Roman census of Egypt in 10 BC. Josephus Mentions a paying of respects in a year known to be 2 BC that would have involved a survey . The Quinirius issue may be resolvable by Luke’s use of the word Hegemon rather than Legatus to describe him, meaning that he may have been a higher official in charge of an earlier census. Whilst in the end it’s not life or death , and as Adrian Goldsworthy’s biography of Augustus states, an early census is, if not known, possible and that we don’t know enough about client kingdom relationships to decide either wAy , mention of this could have been fairer rather than an assumed scriptural error . The issue of the two contradictory genealogies is harder to unpack but there are viable theories about this too which are again not given space . This does leave us with some supposed scriptural errors being taken as fact when they may well not be . This is without mentioning that some of the Author’s analyses of things said by Jesus are blatantly misread and hostile. He also bleats plaintively that a resurrected Jesus moves in a way that contradicts the laws of physics. Well, duh . This aside, the book is a magisterial survey that , alongside the familiar names introduces us to many new ones, and enables us to engage with its broad sweeps via some telling anecdotes . Walter Dixon’s audio reading has not been popular ; I must admit that an English narrator would have been preferable and , while Dixon’s soft spoken American narration isn’t harsh on the ear it is monotonous and sometimes inaudible over traffic and gym music. Notwithstanding that British and American pronunciations often clash, the reading irritatingly changes any reference by the author to his book to audiobook , as though we will be confused if ‘this book “ or “my book” is read aloud. Come on Audible, we are not thick , this is a mental leap we can process . It’s hard to say who this book is written for. Practically every sentence is some new factoid, every paragraph enough to fill an episode of Jeopardy. And with 3000 years to cover, there is no time to come up for air. It’s incredibly frustrating. There is so much emphasis put on facts, that there is no room for insights, or connections between events. But with 3000 years of ground to cover, has MacColloch bitten off more than he can chew?I think so.I’m actually quite torn. There is a lot of good in this book, and things which other historians rarely mention. For example, his mentioning of Ante Pavelić’s Catholic regime that ethnically cleansed Jews, Roma, and Orthodox Serbs, a historical fact that’s often glossed over. He even mentions that some of Pavelić’s methods shocked even the Nazis. Perhaps why this is often glossed over is that the Catholic Church did not condemn the forced conversions of Orthodox Christians. Despite the sheer number of Catholics from Slovenia pleading for a public condemnation from the Pope in 1942, the Vatican had nothing to say.The facts mentioned in this book range from the crucial, to the tangential. For example, Muhammad telling his followers originally to pray facing Jerusalem, and only altering the direction after a disagreement with the Jews of Medina. Or that it was the constant medieval warfare against Islam that gave Spanish Catholicism its militant edge, and strong devotional practice.As for an example of something tangential, and fun? Diogenes of Sinope, whom Plato nicknamed “Socrates gone mad”, often slept in a large wine jar while in Athens. And when one night a young vandal broke it, the ekklesia bought him a replacement jar, and had the boy flogged.I really wish the majority of the book was like this, but it’s not. It blows through history, with a heavy focus on Western Christianity. In fact, there is a heavy bias against Eastern Orthodox Christianity. MacColloch all but takes sides referring to the early Church as the Catholic Church, and only mentioning Orthodoxy around the schism. This obviously implies that Orthodoxy splintered from today’s Catholic Church, and it’s fine to hold this opinion. What’s not fine is to put on a mask of neutrality, while leaving your biases in what's supposed to be a neutral historical work. He even fails to mention that icons were used as early as the 200s, helping to build a case for iconoclasm instead.In fact, MacColloch seems to have an axe to grind against Orthodoxy, in general. Of the Great Vespers on the Sunday after the Feast if the Ascension, MacColloch referred to them as “hymns of hate”, and said that, “such liturgical performance of hatred is embarrassing for modern ecumenical discussion among Eastern Christians …”I try to never throw the baby out with the bath water, but given that the reader is left floundering in facts with no real direction, and the biases against Orthodoxy, I simply cannot recommend it. Five months later and I've finally finished. Maybe I'll write a review sometime in the next five months.